The Green Lantern universe of titles is set to contract after the next chronological series of volumes, but for the moment it expands once again with Cullen Bunn's new Sinestro series, the first issues of which are collected in Sinestro Vol. 1: The Demon Within. Bunn surely gets right the morally-ambiguous Sinestro, one of DC Comic's best villains since Geoff Johns redefined him some ten years ago. At the same time, the book ventures quickly into too-familiar territory and there's hints at times of the wrong turns that the Red Lanterns title took. Sinestro is enjoyable but I hope the current premise is just a stepping stone to something greater. I'm never one to complain about getting more of Doug Mahnke's art, but the variant cover to Sinestro #1 that starts off this volume is indicative of difficulties within. That cover, with the two three-faced Sinestro Corpsmen, the robot, the lady with the skull mouth, and that scary thing that stole babies ("Kryb," I'm reminded), is clearly drawn from the pre-Blackest Night Sinestro Corps era (if not a pin-up that just never got used the first time around). It's a reflection of Sinestro's past, whereas in the present he's since been a Green Lantern for a time and then ultimately left the Sinestro Corps behind to go off on his own with his yellow ring. But it's not more than two issues into the current series before Sinestro has tracked down the Corps, disposed of Corps leader Arkillo (as Mongul did previously), and taken control of the motley group again. Bunn succeeds where early, rougher issues of Red Lanterns failed in that Bunn gives Sinestro and his team constant and relevant direction -- instead of navel-gazing, they're rescuing the survivors from Sinestro's destroyed home planet of Korugar and fighting the anti-emotion cult the Paling. But the Corpsmen on which Bunn focuses are not that interesting, and there's an undercurrent of infighting and bickering similar to Red Lanterns that was what made that title tedious (at least until Charles Soule took over). Sinestro isn't that bad off, but at times I wished the book was indeed "Sinestro" and not, as it seems to be, "Sinestro Corps." Despite some middling secondary characters, however, Bunn does well in a nuanced portrayal of Sinestro consistent with Johns's work previous. 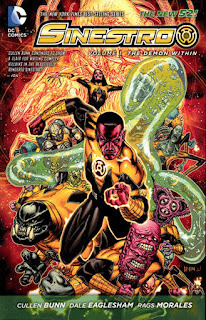 The character especially shines not in the pitched battles (though artist Dale Eaglesham does fine work there as always), but in the conversations, as in the third chapter where Sinestro tries to understand his negative reputation with the Korugarian refugees. Bunn also takes an appropriately long time toward the end with a conversation between Sinestro and Hal Jordan, where each see their own worst qualities in the other. Another bright spot is the presence of Sinestro's estranged daughter, the Green Lantern Soranik Natu. Both artists Eaglesham and Rags Morales have trouble drawing Natu, whose originally high neckline has now dipped almost to her navel; also Eaglesham draws her breasts as two perfect circles floating chest-high. But Bunn presents the kidnapped Natu with every opportunity to leave the Sinestro Corps and return to the Green Lanterns and yet she finds reasons to stay, purportedly to aid the Korugarians but perhaps actually out of fascination with her father. Bunn positions Natu as a kind of proto-Sinestro, not yet having given herself over to evil but staring into the abyss more than a Green Lantern should, and her own struggle in the book may turn out more interesting than Sinestro's himself. Some hesitation that I had about Sinestro came from having read Bunn's Lobo, which I found to be a repetitive series of fight scenes without much character development. Here, too, I found character development sometimes weak; the book's main villains, the Paling, are introduced simply by character Lyssa Drak telling Sinestro they exist, not through any story events proper (and also an anti-emotion cult that's completely unknown and unmentioned by any of the other Corps is hard to believe, though I'm hopeful there's more to Bunn's story). Bunn also has Sinestro Corpsmen Rigen Kalen and Dez Trevius on the page for a while before tells us, via narration box, that Trevius is an assassin and Kale has bits of yellow ring stuck in his skin. By Bunn just telling the audience the information instead of making it part of the story, the characters' lives aren't as immersive as they could be. The Futures End issue that closes the book reasonably reads as the projected last issue of the series, taking up current plotlines with a future spin. Aside from being set around the new Sinestro Corps base of Necropolis, and including Natu as a Sinestro Corpsman among others, I also liked the at-random inclusion of the Indigo Lantern guardian Natromo. There's a flashback within that I found tough to follow on first read (and I'd be curious to know just how far "back" the flashback is meant to be between the present and five years later), but it's a satisfactory issue among Futures End tie-ins that didn't fit their series as well. I'm on to the Green Lantern "Godhead" crossover now as my main reason for picking up Sinestro Vol. 1: The Demon Within before it's involved there. This is fine Sinestro fare, not the best the character's ever been written but certainly nothing that does Sinestro injustice. My hope is that this first volume helps Cullen Bunn's Sinestro get its feet under it, and only better things lie ahead.